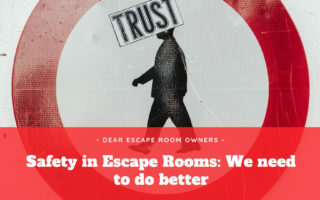 As Edinburgh offered more than one Escape Room, we did the best to try as many different Escape Room companies as possible. 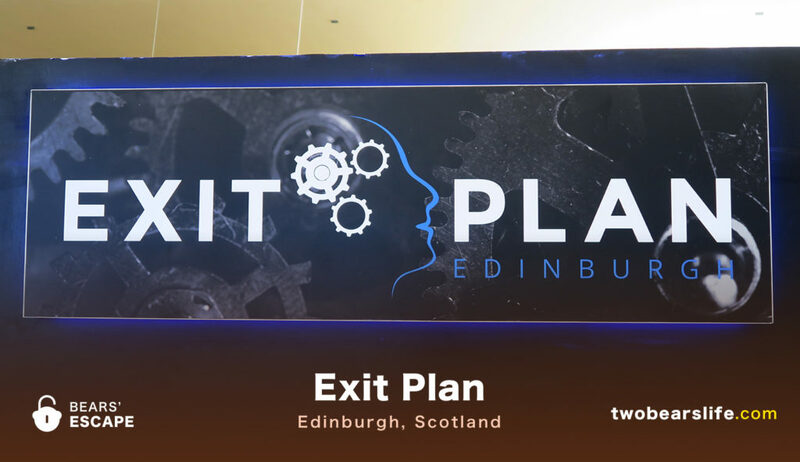 The second booking we got was at Exit Plan Edinburgh, which offered three games as of the time of our visit. We went with a group of six people, this time introducing two more of our friends to our obsession – escape rooms. 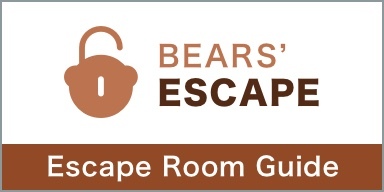 Let’s start the Bears’ Escape Review. 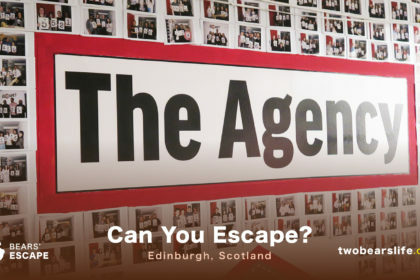 It was 9 o’clock in the morning on a Saturday when we arrived at Exit Plan Edinburgh. Not fully awake, but ready to take on Svangeli’s Lair. It looked like we were the first team to start a game on this day. Considering the time, that was not really a surprise. 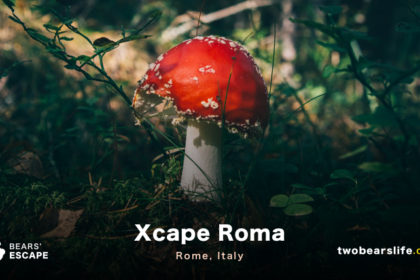 The website, which actually gives good information for all of their rooms regarding recommended group sizes and difficulty, labeled this one as their hardest room, so we were super exited. 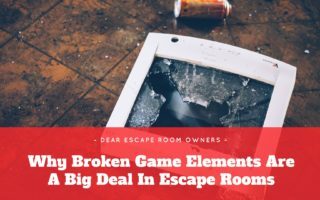 We were welcomed by our game-master, who asked us to shortly wait in a small waiting area, where we used the time to explain the escape room basics to our two newbie team members. 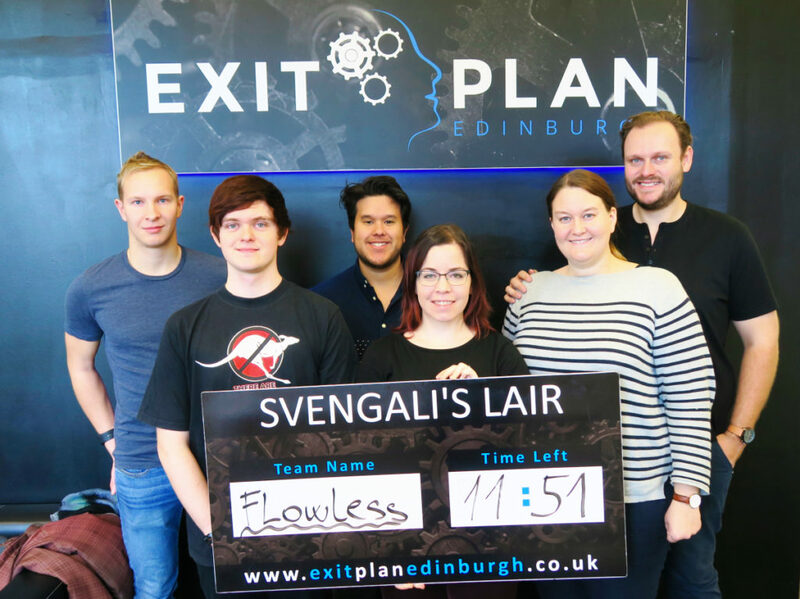 After the short waiting time, we got the room-rules explained by our game-master and off we went into Svengali’s Lair at Exit Plan Edinburgh. You are woken up by a maniacal laugh. It sends a chill down your spine. That crazed cackle is unmistakable – you have been captured by the evil genius Svengali for his own twisted amusement! Handcuffed to the wall, you are completely at the mercy of your captor. But he has a game for you to play in order to earn your freedom. If you defeat the devious puzzles the dastardly Svengali has set for you – you will be free! You actually start the game handcuffed to the wall. The game offers nice audio interludes by Svengali himself, who captured you and challenges you to escape in 60 minutes. The puzzles are mostly in a linear order, which can be a bit problematic with bigger groups, but it works well for the story driven elements of the game. The game-master offers clues through a tv screen on top, as well as some story driven clues that come automatically when you pass some puzzle successfully. The flow in the game works well and there were only one or two instances were we were stuck as a group and did not really know what to do next. The only negative element in the game was the level of light or the lack thereof in the layer. The room is, fitting to the story, a little bit dark. For that reason, Exit Plan Edinburgh did put flashlights for all the team members in the room. Problem was – they barely worked. It looked like the batteries ran out on most of them and the only two that worked – worked barely and actually stopped giving any light during our game session. When we tried to talk to the game-master about it during the game, we never got a reaction about the barely working flashlights. Nevertheless, we finished in time and escaped successfully. The puzzles involve some padlocks as well as mechanical and other puzzles, which was a nice mix. Six people felt a little bit much for the room itself, since it was story driven and we could not do too much stuff at the same time. On the other had, the game flow worked well and we did not need too much support in finding the next steps. Technically, everything worked well except for the lamps – which would have been a bigger deal if we wouldn’t have had our phones with us. But, to be fair, that’s an easy thing to fix and hopefully they will check those lamps better the next time. Our game-master was nice and the clues were on point when we asked for them. Since we were the first and only team present when we played, I can not tell you how many games a single game-master has to overlook normally. The rooms, as well as the waiting area and toilets were clean and the website gives reliable information about the rooms. All in all, we would recommend to play Svengali’s Lair with a group of two to four. The location is close to the center of Edinburgh, so we were able to walk there on foot. The rooms, the waiting area and the toilets were clean. The production value was okay and the staff was nice and attentive. Sadly, the broken flashlights should not have happened and we did not even get a response when we tried to ask about them. The game had some nice puzzle ideas we have not seen before as well as a really cool task in the end, which was exciting. Check them out if you are in the area. 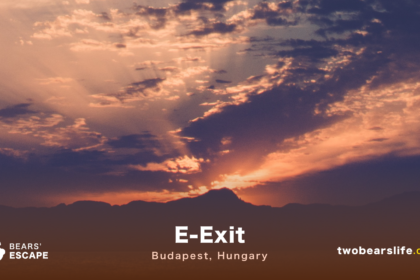 Also – check out and follow us on YouTube and Like our Facebook Page to stay up-to-date about our posts.